For me, the big question for Thanksgiving is what’s the best way to cook turkey. Over the years, I’ve tried dozens of methods, from roasting, baking, braising to deep-frying. As you might imagine, my current favorite method involves building a fire—specifically, firing up a smoker or a grill. Over the next month, I’ll be sharing with you my favorite live-fire cooked turkeys. To get you started—here’s a adobo-marinated, mojo-sauced, Latino-inflected bird from Miami that broke me out of my New England mindset—cooked by a method that may not yet be in your repertoire: spit-roasting on the grill. Later this month, I’ll share my recipes and techniques for making a bourbon-brined, cherry smoked turkey and an eye-popping beer can turkey. You’ve probably baked, indirect grilled, or smoked a turkey. Spit-roasted: not so much. But the slow gentle spin of a rotisserie is a great way to cook a turkey, producing uncommonly crisp skin and succulent tender meat. Here’s what you need to know. Another advantage of spit roasting on a charcoal grill: You can toss a handful of soaked hardwood chips on the coals to generate wood smoke. On a gas grill, you want a gentle heat for several hours so you cook the meat through without burning the skin. Set the rotisserie burner itself on low or medium. For additional firepower, particularly if you have a 4 to 6 burner grill, set the outside burners on medium. Turkey breasts are great cooked on the rotisserie. Start with a 5- to 8-pound breast. Ask the butcher to truss it into a compact cylinder (if not already trussed already). Marinate it overnight in the adobo. If the skin starts to brown too much before the turkey is cooked through, loosely wrap the outside of the bird with foil. 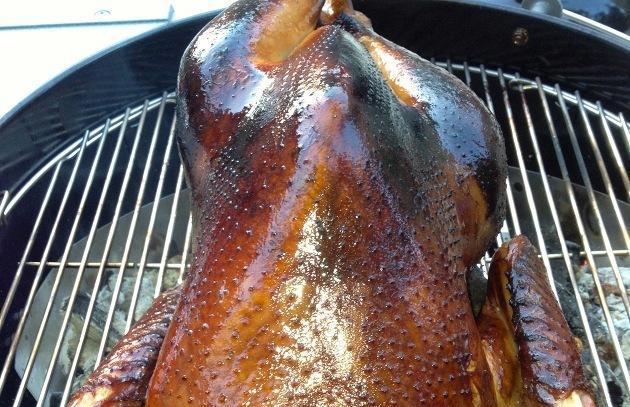 Do not wrap tightly or the bird will steam, making the skin soggy. Need more ideas for main courses on the grill? Alternatives to Thanksgiving turkey include barbecued chicken or Mark Bitterman’s Salt Brick Grilled Chicken.